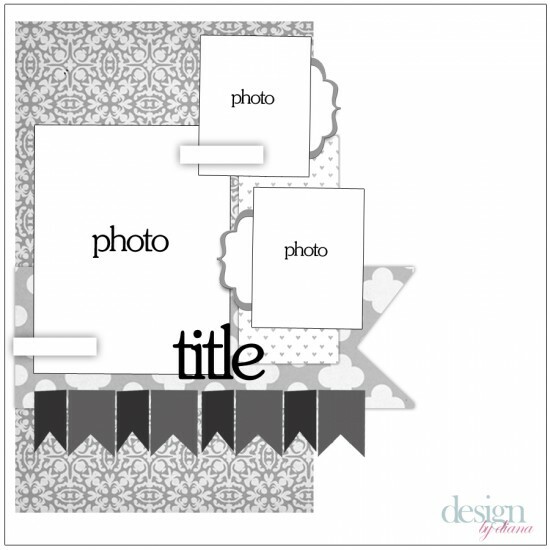 I got play along with the designer challenge over at Jillibean Soup. The challenge is to use their buttons!! 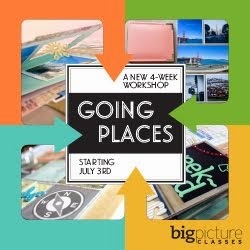 And to top it off they will pick someone to be a guest designer How cool is that!! 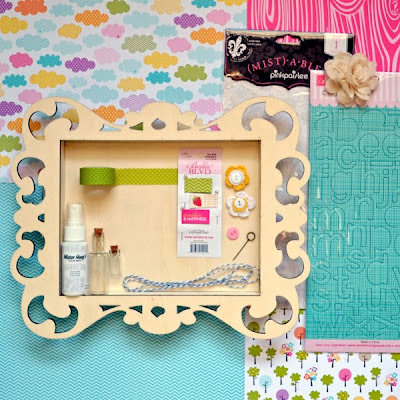 I "heart" Jillibean's products. So for this layout I have a mixed several different "soups" Sweet & Sour, Apple Cheddar, Cocont Lime, & Neoplitan Bean Bisque. And the buttons are called "Cool Beans". Hexagons seem to be "in" so I thought I would try to make some. I think they turned out cute. My title is a mix of cutting letters out of paper and sticker alphas. My daughter had the best time playing with the worms. And I love the saying on that diecut. A close up of the journaling. 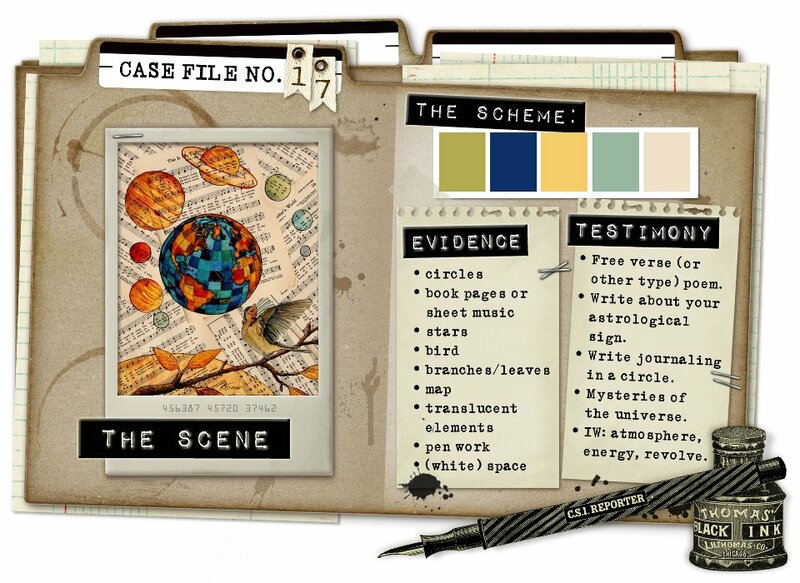 Today a new case is open over at CSI: Colors, Stories, & Inspiration. I think this was my favorite case to work with. Two weeks ago my hubby's pap passed way and the summer before I took this "generation" picture of him, his dad, his pap, and our 2 boys. At first I got all this "do we have to?" and now I get "I'm so glad we got that picture!" For the testimony I wrote a poem. I wanted to show a close up with pap. For the evidence I used circle, stars, and pen work. I doodled stitched around the papers. This is the last week The Paper Bakery is sponsoring the challenges so head over a play along to win a prize from The Paper Bakery! I have a fun sketch challenge for you today! Hambly Studio is now doing monthly sketches and there is a prize involved. You have till May 10 to play along. Here is the sketch by Leah. I used some Hambly banner rubons. I also added a metal bird from MME and a button from Studio Calico. 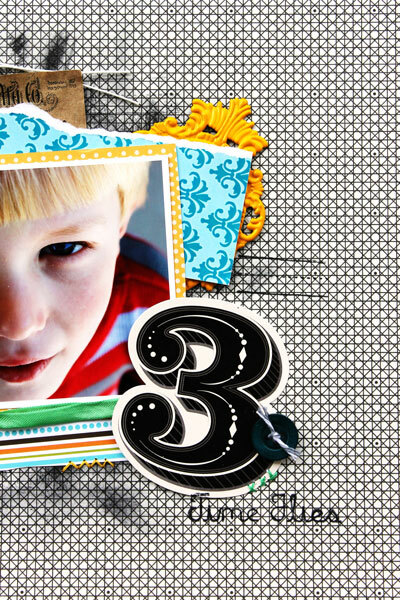 I took some Studio Calico wooden banners and used the banner rub ons on top. And I really love those new mini overlays Hambly created. 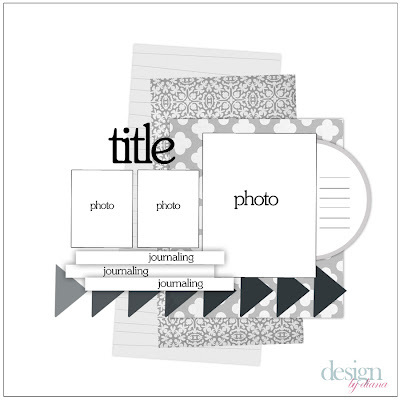 Today I wanted to share with you all a fun layout I created using the Jillibean Soup sketch and of course Jillibean Soup products. One of my favorite lines from Jillibean is Sweet & Sour Soup. I love the colors and designs. This is my little Hannah who love to paint. I love the cute little diecuts. And here I added some twine and a Jillibean pin. I couldn't wait to share this layout with you. 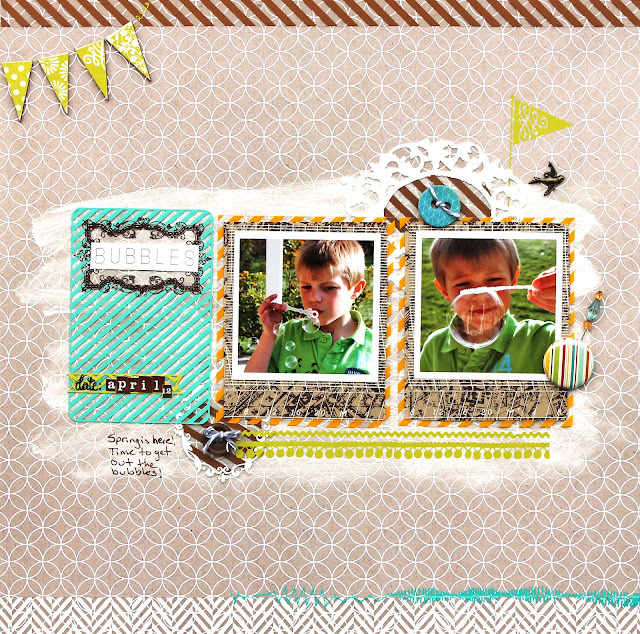 I created this layout using The Paper Bakery's April Add-on Kit "Sunshine Acres" (sold out). 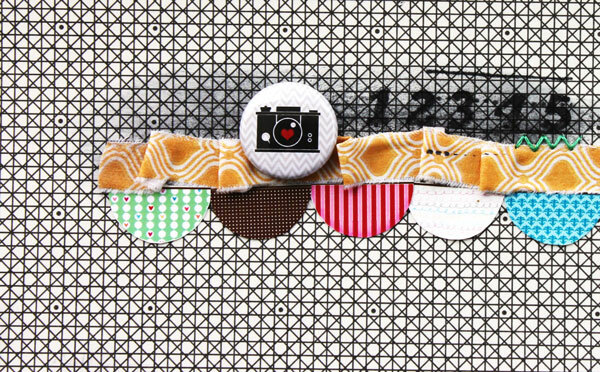 I had a lot of fun with this embroidery sheets from Clever Handmade. 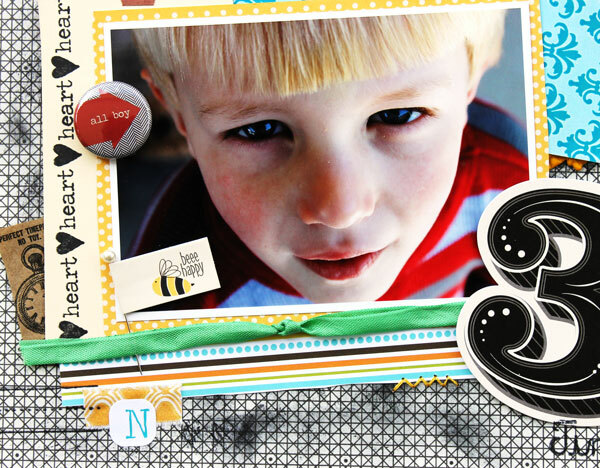 I took black ink and "painted" behind the picture and then layered my paper and embellishments. I love the big numbers that come in the kit; they make the page pop. And see the yellow popping out?...it's a metal piece from Pink Paislee. I also added some Studio Calico stamps and flairs from my stash. Today I have a sad announce to make Burlap & Buttercups has decide to close up shop. This is sad but I completely understand why. 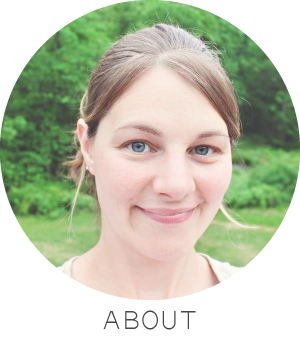 Rachel (the owner) home schools her kids and running a business takes a lot from that time. I had fun creating with her kits and will miss them but at least I made some great new friends through B&B! 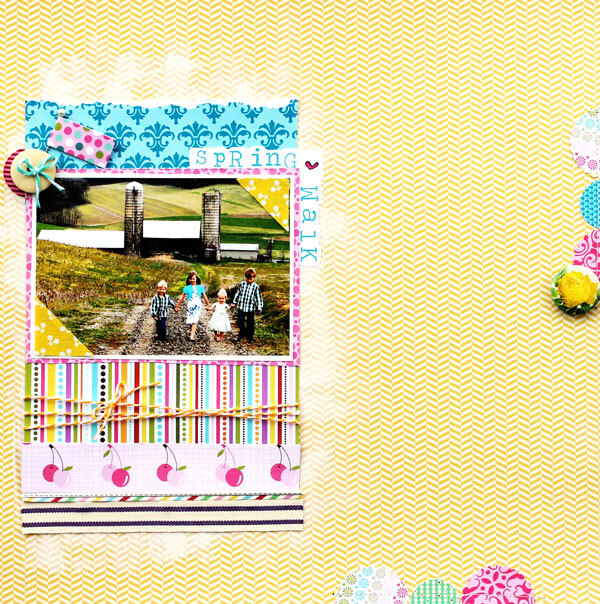 Here is one last card I made using the April kit. This is a card I would like to say is for Rachel. It's a thank you for all she did for us and the club!! Thanks for stopping by!! 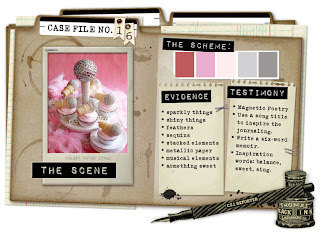 Today over at CSI: Color, Stories, & Inspiration there is a new case file being investigated. This one had some "pretty" colors involved. And The Paper Bakery is this months sponsor!! I used some Girl's Paperie, Jillibeen Soup, & Studio Calico. My testimony was song lyrics from Keith Urban "Sweet Thing" and my journaling was about my "pretty" necklaces I like to wear on those special occasions. See I'm just a jeans and t-shirt kind of girl but once in while I like to wear "pretty" things. 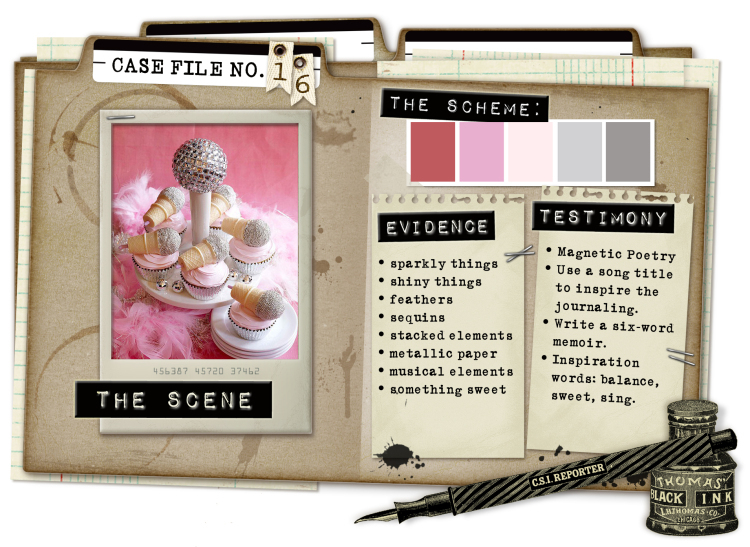 My evidence is stacked elemnets & sparkly things (I added bling). I don't know about you but I miss Sketchy Thursdays! So I was excited to see one of their sketches over at Scrapbook Circle. I have the April Daydreamer kit and wanted to play along. The colors in the kit go so well together. And here is my take. I love these 4!! 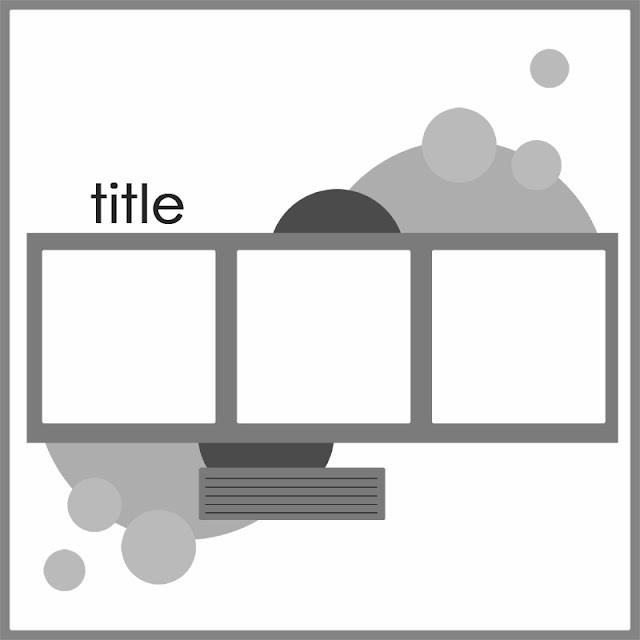 I used one of the cute printables for part of my title. And aren't those frames so cute!! I really love those Heidi Swap mistable banners and the AC fabric stickers. Today I wanted to share the sketch challenge over at Burlap & Buttercups. 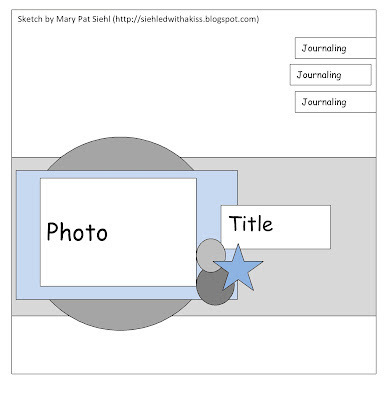 Mary Pat makes some fun sketches for us to use. And there is always a twist... along with using the sketch you are to use some paint or mist. That is easy for me since I use some mist or paint on most of my layouts. I love the colors in this kit. And those clips are so fun to add! The Ormolu fabric tags are great too! 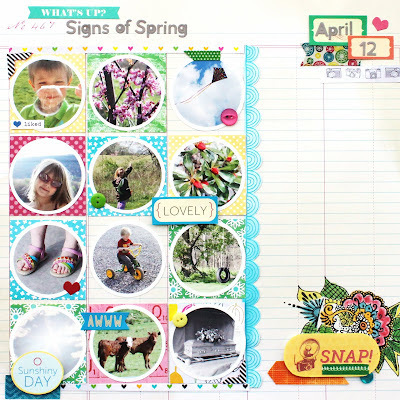 Today I get to share my Take Twelve layout with you all. 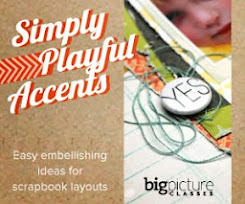 I'm really enjoying this challenge over at Ella's Publishing! I have to admit this was a very difficult day for my family(see below) but we ended it with some fun springy things. 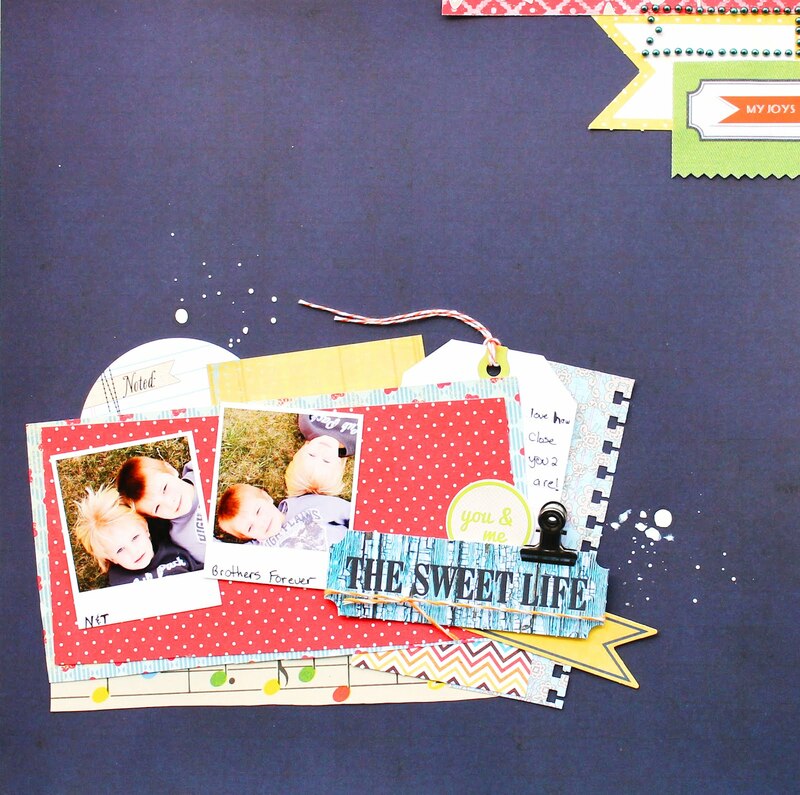 For this layout I used the April kit from Scrapbook Circle. So the difficult part of the day was the morning when we had to lay to rest my hubby's pap. Our family was very close to him. He was a great man who taught my husband so much and loved our kids greatly. Those are his cows you see. Aren't they cute?! The one had to be bottle fed. I made the paper like a card and wrote on the inside behind the picture. And then we came home and the kids rode bike, blew bubbles, flew kites, and just had fun. It's what you need after an emotional morning. Here are some close ups of the layout. The flower was plain so I took paint and mist and colored the flower. 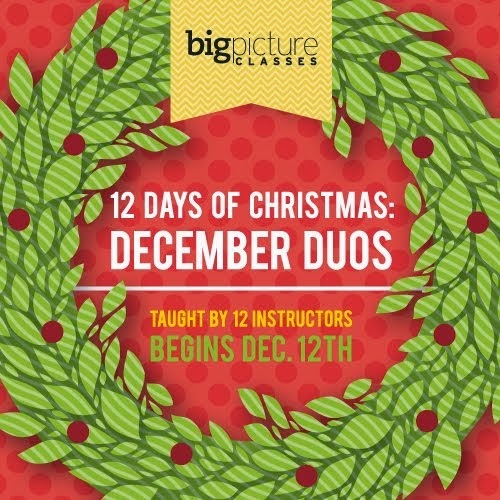 If you are participating in the Take Twelve Challenge make sure to link your layouts HERE for your chance to win. Thanks for stopping by!! Today I get to share the full reveal of the April kits from The Paper Bakery. 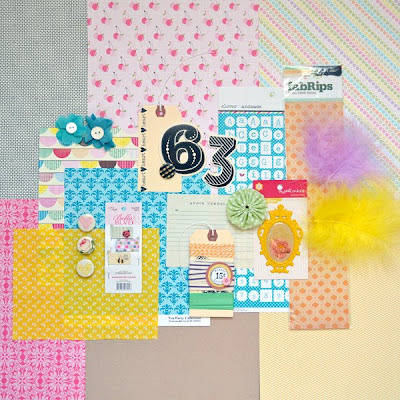 These kits are full of color and some really great new and fun items. This is the project kit "Spring at Heart" And this is the Add-on kit "Sunshine Acres"
This is a layout I made using the add-on kit. I also used the sketch Grace designed. 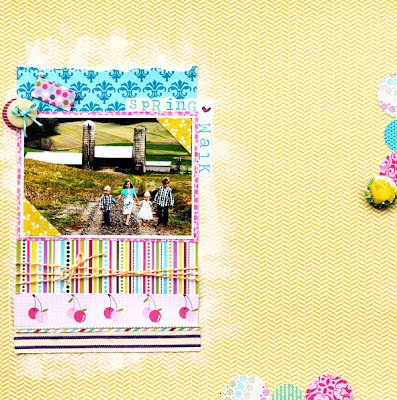 And here is a card I also created using the same kit. And I also used Grace's Sketch #2 you can play along HERE. This weekend I enjoyed some scrappy time. 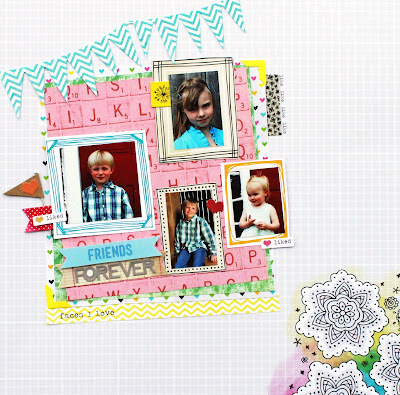 I worked on the new Scrapbook Circle Challenge to use neon colors. I used this months kit "Daydreamer". 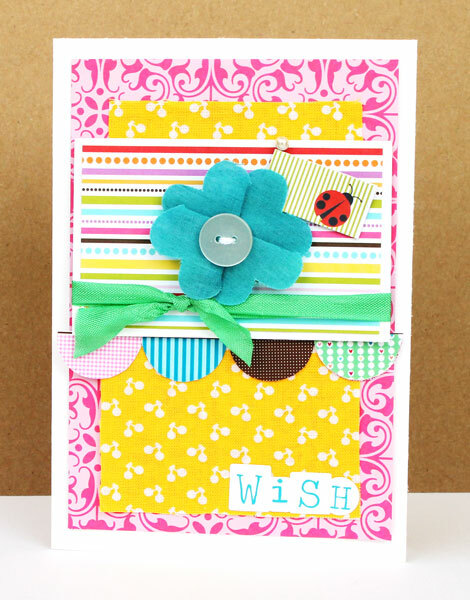 This kit is full of great, bright colors! This is my boy Noah, giving me a flower. Such a sweetie! I had fun painting with paint and mist on my background. Love the colors to layer and those frames are fun to add a little texture! I used a clip I had in my stash. Here I used some of the printables that you get exclusive with the kit.